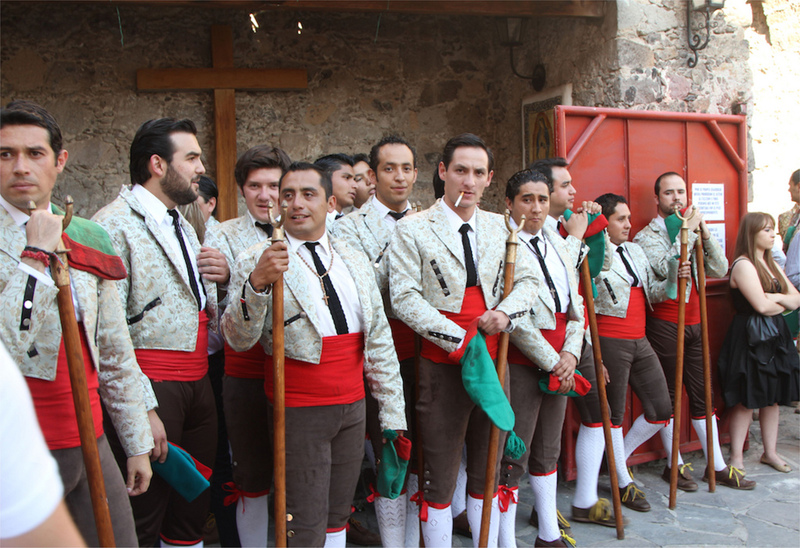 A Bloody Good Time: At the Bullfights in San Miguel. | A Continuous Lean. We won’t get into a discussion of animal rights here, but while unquestionably meeting a cruel and bloody end the bulls are said to have a far better life than most of their ilk up until the final hour. And though they haven’t got much of a chance, there’s always the possibility that the bull will do some damage. The matador who risks nothing will never achieve greatness, and the best bullfighters stick their necks out the farthest. Prayers to the Virgin of Guadalupe are given before each event. 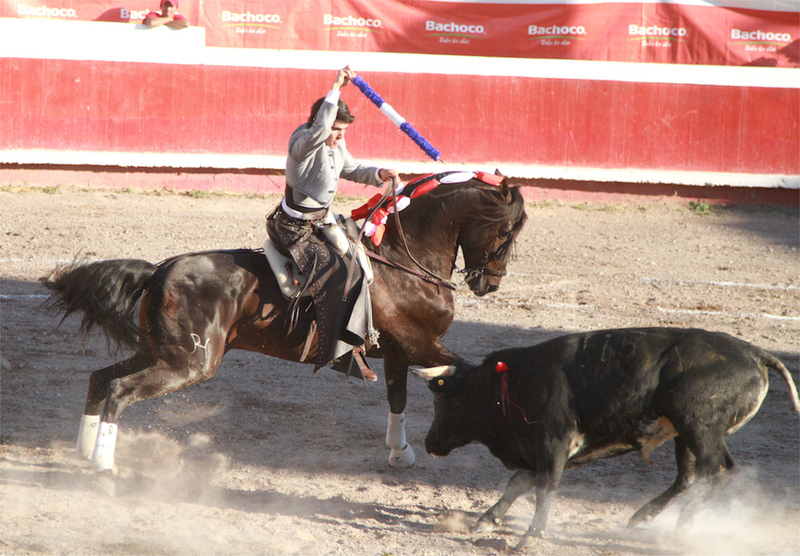 In San Miguel the bullfight, or corrida, is in fact a corrida de rejones, meaning that the matadors – in this case rejoneadors – are mounted on horses. That may sound safer but repeatedly stabbing a raging, stampeding bull in the back, from the front, on horseback at full tilt while wearing a suit and hat takes serious cojones. 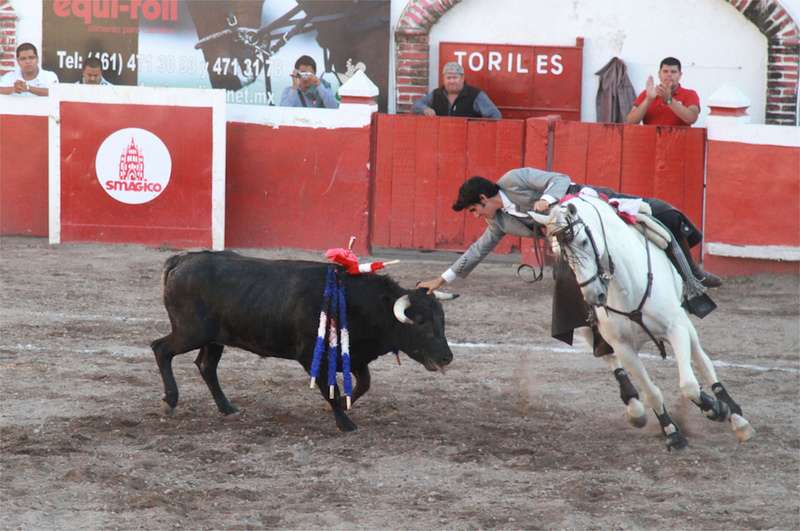 Corridas in San Miguel feature three rejoneadors taking on three bulls apiece. 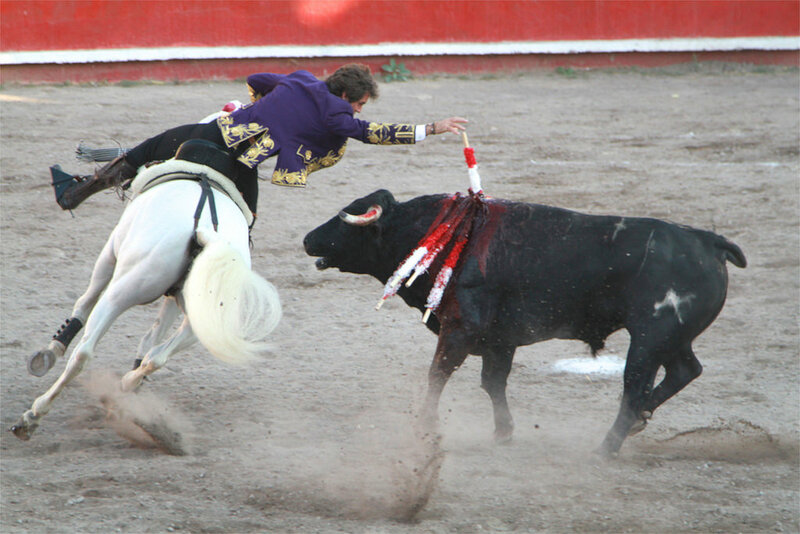 Each bull is dispatched in three stages called tercios in the classic Spanish style, wherein swords and lances of ever shorter length are driven into the bull’s back in increasingly precarious ways, until finally the animal collapses and is killed with a coup de grace. It’s gorgeous and a bit gruesome, a Goya painting come to life. 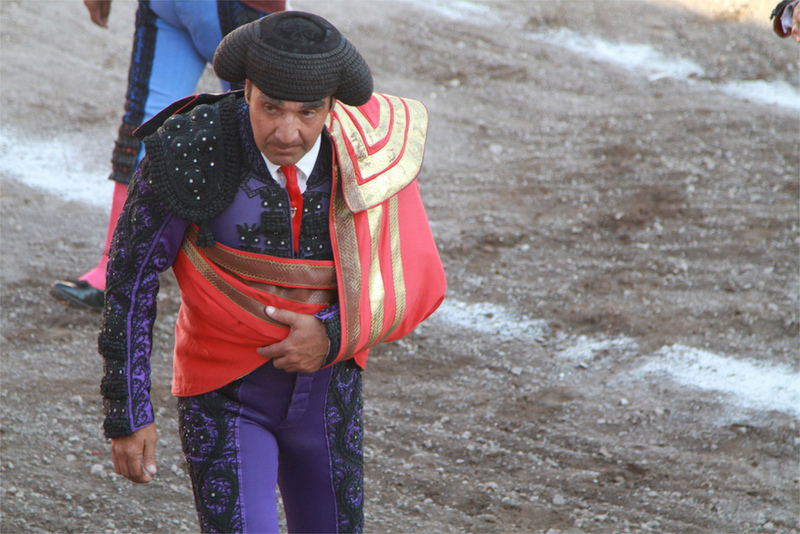 Aside from the rejoneadors, there are toreadors armed only with capes and clownish forcados who keep the bull occupied between tercios while the rejoneador changes horses. 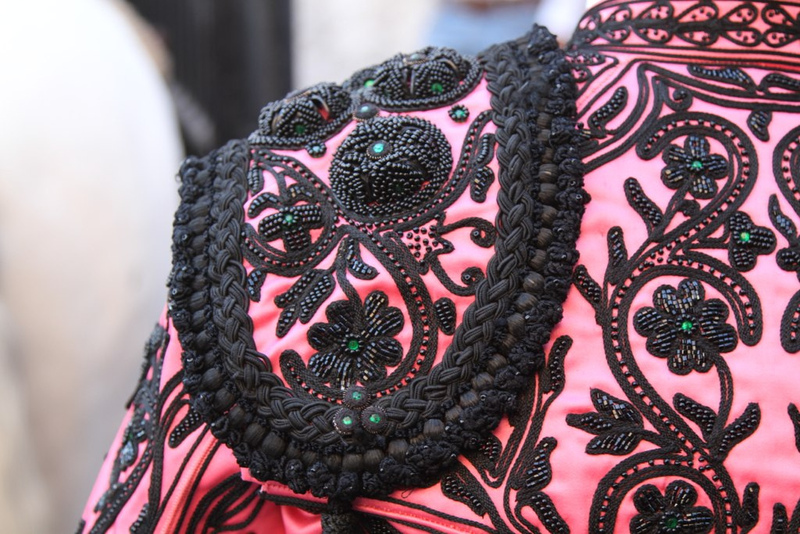 The toreadors are the most colorfully, in some cases outrageously, dressed, all acid pop oranges and prostitute pinks, while the much younger rejoneadors are fairly soberly attired and the forcados look like Santa’s helpers. The latter literally grab the bull by the horns. Most of them end up smeared with a fair amount of blood by the end of the night. During the fight countless vendors dispense souvenirs and also beer – served two at a time in a deft one-handed pour – wine and anything else you care to drink, as well as Cuban cigars nestled against big stacks of Bubble-Yum and candy on wide wooden trays. 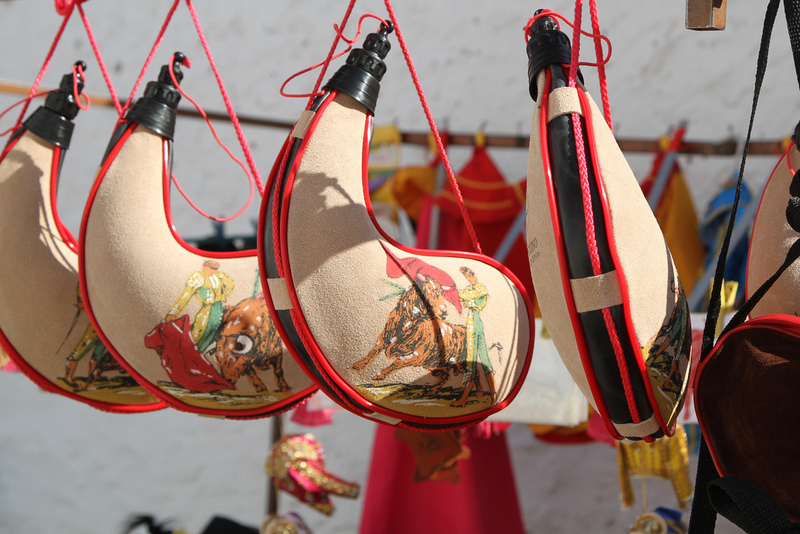 Souvenir wineskins painted with bullfighting scenes are sold outside the main gate of the old stone corrida, and can be filled from an enormous wine barrel wagon parked out front. You can also order an entire bottle of Johnnie Walker if you so desire – but you have to drink it all out of a plastic cup, Big Gulp style. As the fight begins both dust and cigar smoke cloud the air while the ubiquitous off-key brass band strikes up a tune. We’re pretty far up in the mountains, but the crowd is thick with Chilangos, the slightly pejorative term for people from Mexico City. The New Yorkers of Mexico, in other words – assholes. But the girls are great looking. The main draw is always Pablo Hermoso de Mendoza, as famous in Spain as any movie star, considered by many to be the best rejoneador in the world. 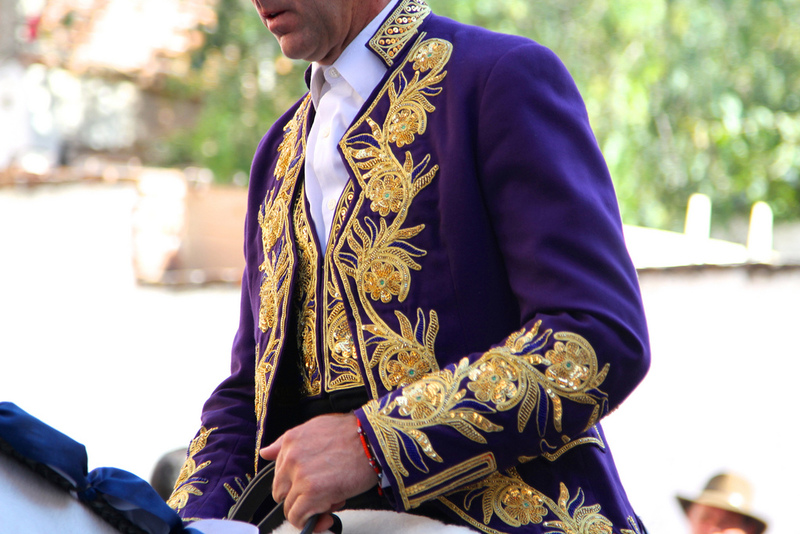 A little older than the others, he alone among the bullfighters wears a colorful brocaded jacket. The horsemanship and dressage is truly incredible, the rejoneadors effortlessly exerting total control over their mounts, executing twists and twirls even as the bull’s horns brush up against their flanks. In years past, the horses had mattresses strapped to them to minimize serious injury; these days the bull’s horns are filed down a bit. Eventually, no matter how fierce, the bull is killed. The rejoneador, assuming he hasn’t made a total hash of it, is then awarded a trophy determined by his bravery and skill in the ring – usually one of the bull’s ears, sometimes both if it’s been a particularly good fight. 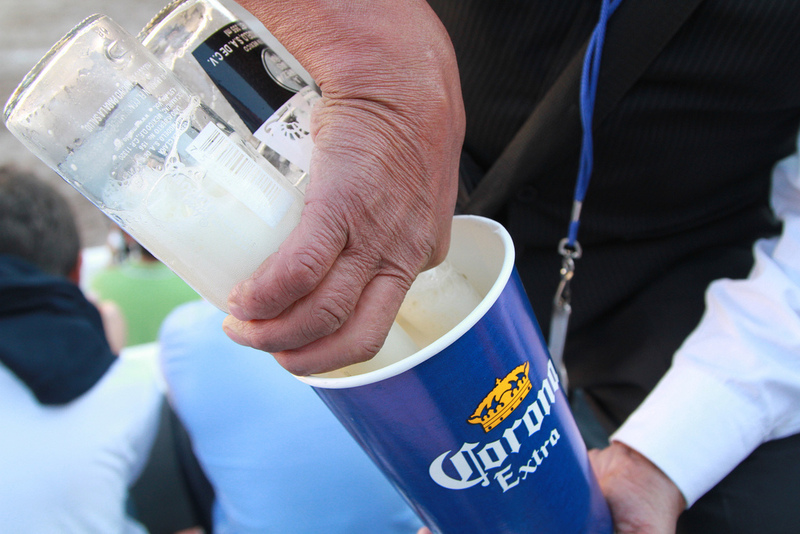 Often the rejoneador will toss one of them into the crowd. All photos by Jared Paul Stern. There is no consent from the bull to participate, therefore this is not a sport nor are the bullfighters engaging in sporting behavior. This is nothing more than savagery in a country that is a caricature of masculinity. Strutting peacocks in a rigged game where danger to them is kept to a minimum (for example, the filing down of the horns). A culture can be objectively judged by how it treats its women, children, animals and the vulnerable – Mexico is wanting in all respects. Bullfighting is just one aspect of Mexican cultural norms that explains its descent into a corrupt, violent, and failing narco state. I have always wondered about the stakes planted in the nape of the bull’s neck. How do they stay in? Are they barbed and weighted on the handle-end so as to tear more with each buck or lowering of the head? I wonder about their actual pain, simply because the nape is an insensitive area (mother dogs and cats carry their offspring by the nape) or when a vet injects a dog, that’s right where they go with the needle. As a culture we need to be more open minded of the traditions of others. Those that advocate for banning the sport of bullfighting should study its historical significance & perhaps be reminded that we need to respect cultural traditions of countries far older than the US! Hey @Oscar, there have been plenty of cultural traditions in history that were cruel and inhumane. Just because a culture has a tradition is no excuse to condone it. Slavery was a “tradition” in many cultures through the ages. I grew up raising cattle and I’m no PETA member, but bullfighting is pure and simple the torture of an animal over a drawn out period. Sure the torturers are dressed pretty and some consider it macho, but let’s call it what it is. 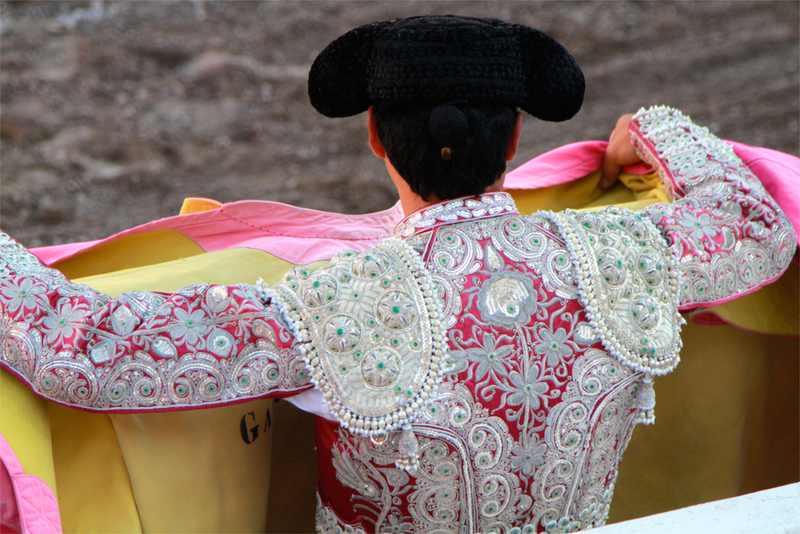 I would love to see a bullfight sometime in the near future. There is a plaza de toros not far from where my grandmother lives and I hope they still go on there. Call it torture or what have you, but to attack the people who perform them or the countries where they happen is immature. Not every country in this world has had the “luxury” to care for animals as we do. To some, they are simply animals who serve a purpose. Pumping poisons and caging them in the name of the mighty U.S. dollar is if anything more barbaric yet we can’t really call ourselves barbaric can we? If you believe that the bulls killed for fun in the arena have led a better life than other bulls, you know nothing of bullfighting. These bulls have been taunted, drugged and tortured for weeks on end to display the behavior the crowd wants to see. I’m disappointed you would run this article. This was the last time I visited this website. “Gorgeous and a bit gruesome”. What a moronic statement. Got bored with ‘style’, I guess, fancy dud’s not edgy enough, so lets rock animal torture? Hey Michael – the only credit I give you for publishing this article is for finally providing some content that is though-provoking if not controversial. However, I’d suggest that your readers are probably a fairly intelligent, and even open-minded, bunch, and this obtuse presentation of a highly senstive topic seems almost intentional. I don’t sit on any ethical high-horse. I eat meat, wear leather shoes, and probably take for granted the impact we humans cause to other species in order to consume the things we appreciate. But maybe like many, this glorified and heartless tradition just doesn’t seem to sit so well. Stating in your article that “we won’t get into an animal rights discussion” and then calling this act “gorgeous and a bit gruesome”… ? hmmm. You know, I would be incredibly interested to hear an opinion from someone who you seem to respect so well – your American badass Audwin P. McGee. Most hunters I have met have a respect for nature and animals, and understand the basic requirement of hunting is to provide. Hunting is a sport yes, but a sport with inherent respect for the animal. For me, people who appreciate this spectacle are dim-witted and severely lacking in moral sentiment and intelligence. I put them in the same bucket as those slobs who celebrate cruelty and sport with illegal dog-fighting and other such endeavours. There is no sport here, just a dumb stimulation for those lacking any real appreciation in life. In the words of Mr Hornby, what really matters is what you like, not what you are like. I’m so happy to see several of your readers speaking out. I’ve never commented on a story here, even though I’ve been reading for years. I appreciate this blog’s coverage of how things are made, and exploring places and processes to which I would otherwise have no access. However I think I am probably with the other commenter, who says that this is the last time he will visit, and I will be sure to tell any others who mention this site. This is an open endorsement of the torture of animals. 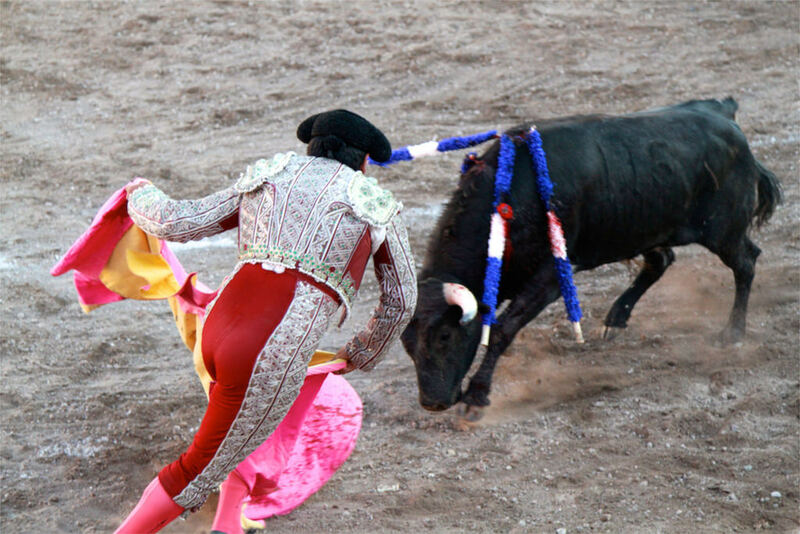 You have failed to recognize that the likelihood Mexico – even “with its deep-rooted love affair with death” – will eventually ban bull-“fighting” is not a reason to rush to patronize the organizers but rather a signal that we as human beings are in fact better than this. You endorse many things on this site which I will never buy, but this is nonsense. @Eric, by all means, go a see a bullfight. After that, you can head over to Africa and the Middle East and catch another deeply rooted cultural tradition draped in ritual and blood — genital mutilation procedures on young girls. UNICEF reports FGM has been carried out on 125 million young women. Much like the bulls, these girls don’t have any say in the matter. ACL was on the wrong side of history with this post. Really shocked that my favorite site would publish this. For those of you who have spoken out, the post is not a political commentary on bullfighting, just a showcase of an old, dying tradition that still exists for now in certain corners of the world. 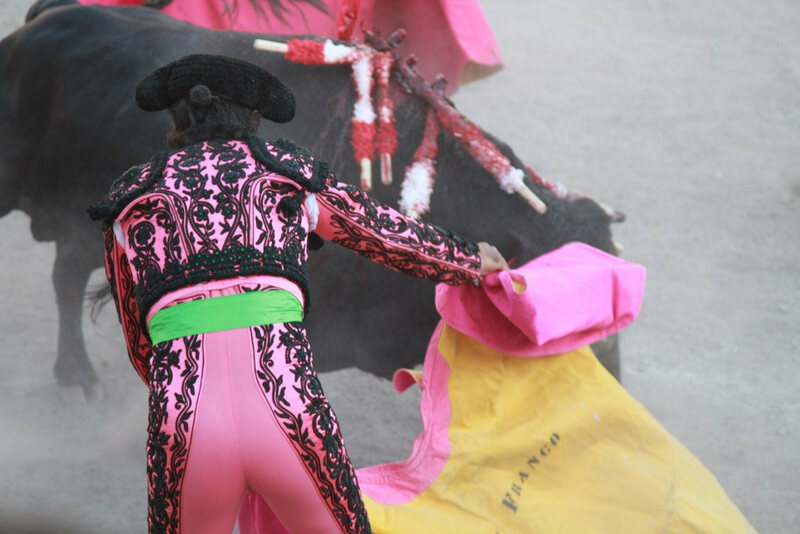 If this post in any way helped turn people off bullfighting, all the better. The more dialogue about topics like this, the better. I’m Jeff on 3/23, and I will expand on my well-cliched comment. 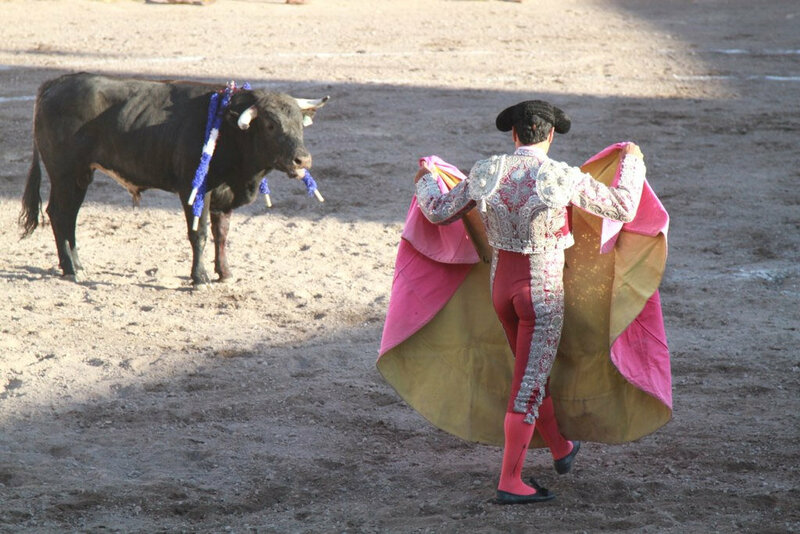 Bullfighting is offensive, but it is also offensive to judge a whole nation and culture based upon one flaw — especially when it comes with a dollop of self-important moralism. Would you condemn our nation’s culture and character solely on one atrocity? Pick your least favorite. 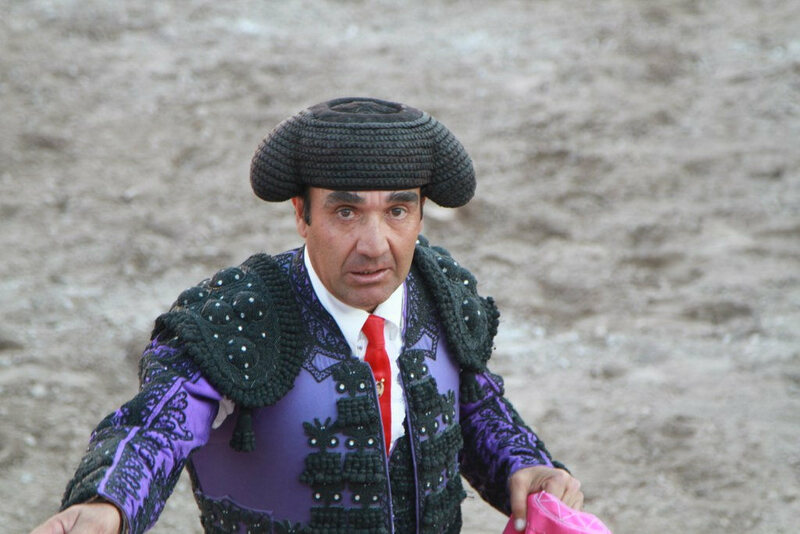 Moreover, connecting the existence of bullfighting to the cartels is just plain dumb. After all, those cartels exist only because of our antiquated drug laws and voracious hunger for a high. 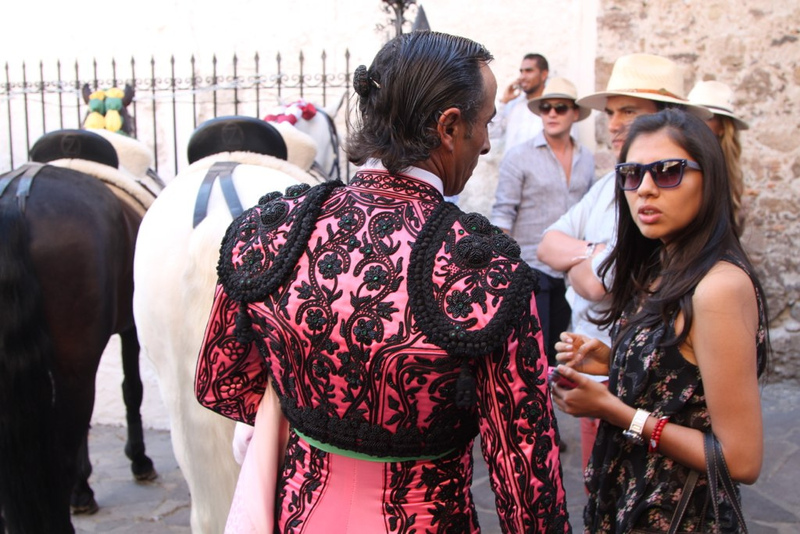 I’ve actually been to a bullfight, a truly crappy one in Nuevo Laredo many years ago. As I recall, a few performers displayed some true skills, but the show was otherwise bedraggled and even surreal. It’s a dying tradition. Sometimes, we find beauty in brutality. Our moral universe is not black and white; it’s a million more shades of gray than 50. Michael, your response is a disappointing sidestep. Jared Paul Stern’s post clearly glorifies the act, in ways both subtle and overt. To say that it is “beautiful, brutal and balletic” and call the act “gorgeous and a bit gruesome”, is not showcasing an old tradition, but rather a romanticization of ritual torture. Oh gosh, now Michael will never be able to do PR for PETA. 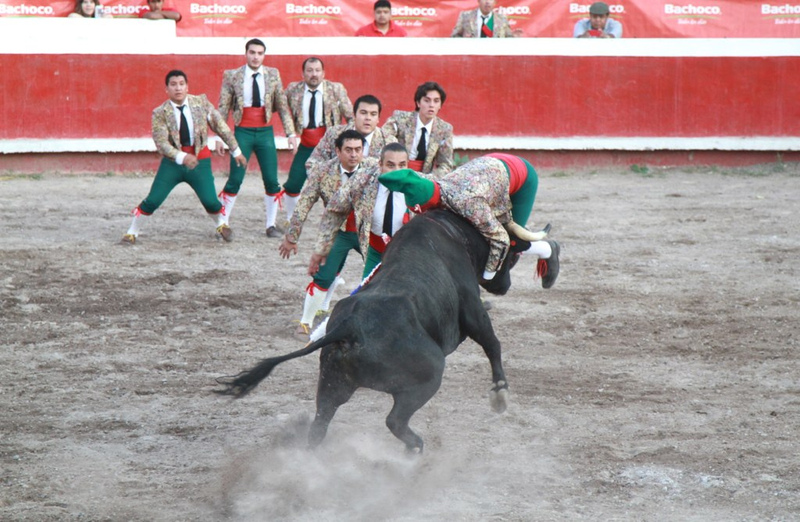 I saw a bullfight in Puerto Vallarta Mexico well over a decade ago when I was a teenager. It’s an experience that has stayed with me, vividly. I don’t think I could ever attend one again, it was gruesome. But it was fascinating at the same time. It made a foreign culture I didn’t understand more palpable. It will soon be a thing of the past, and rightfully so, but it’s not an experience I regret having. Culture is what I come to this site for, not just fashion. Still enjoy the posts, Michael. I suggest reading “Or I’ll Dress You in Mourning” by Larry Collins and Dominique Lapierre, the story of the great Spanish torero, Manuel BenÃ­tez PÃ©rez “El CordobÃ©s”. I was captivated by the history of the Spanish Civil War and Franco, but mostly by El Cordobes’s struggle against illiteracy and poverty and tradition to reach the height of his calling. By the way, I read this book when I was in elementary school. Yes, indeed, I myself picked that book right off the public library shelf. That time was probably just the right age to do so because even then I understood that the lesson from El CordobÃ©s was of perseverance. I realize the thought of a mere child of 11 or 12 reading about such a disgusting and gory subject is going to sicken thoroughly some of the posters (though I suspect video games of war and crime are totally fine). Nonetheless, on a cross-country trip around the same time, my parents had taken me to the Chicago Stockyards so I could learn that meat didn’t just arrive in white butcher paper. 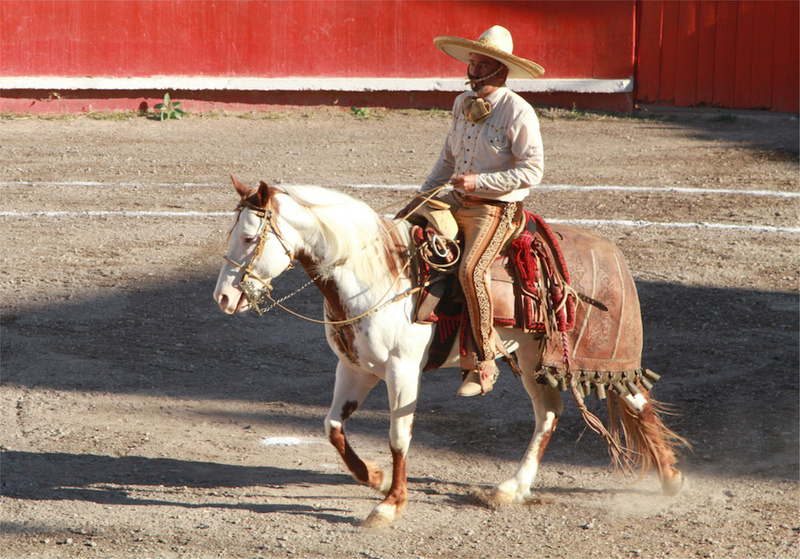 As for the toreadas, my grandfather, who had once run cattle on his land, took me to one in Hermosillo, Sonora MX when I was maybe 8 or 9; I saw one in Spain and one in Portugal (where the method is different) several years later as a teenager; and on trips to Mexico I’ve gone to several bullfights over the past few decades. 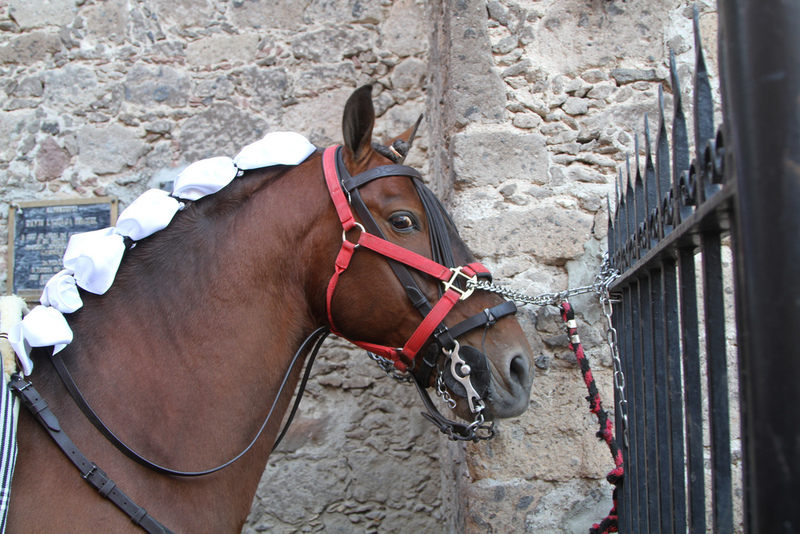 Human culture is fascinating- I love Mexico. I didn’t realize that so many readers of ACL were such wusses. N.B. to Jared Paul Stern: It’s “DÃ­a de los Muertos”. I never thought much of Papa Hemingway’s macho posturing (Are we trying to prove something? and I think we were.). While I know his “interest in death” quote, I’m not sure he ever understood Hispanic culture. After all, Day of the Dead in Mexico is more a festival for remembering with our own deceased that we all die (with a bit of much redacted Aztec gore thrown in, I’ll admit). If one wants to believe a great hunter like Hemingway really forgot his shotgun was loaded as he cleaned it, then it’s also okay to take his word about cultural phenomena. Otherwise, a good stab at an interesting human tradition. People won’t be happy until we’re all the same yuppies (or as Bebe put it wusses) and being super duper safe with lots of spending money.